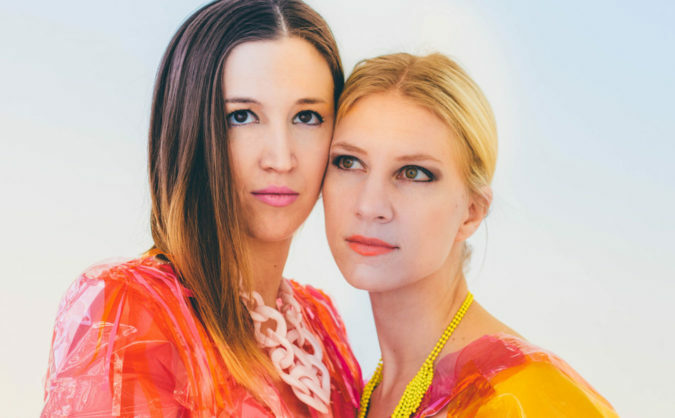 Seasaw are the Madison, Wisconsin duo of Eve Wilczewski and Meg Golz. The band specializes in folk ditties that include intricate vocal harmonies and playful electronic elements. Last year, the band released its sophomore LP, Too Much Of A Good Thing. Seasaw has a flair for cover songs, too – they’ve covered Weezer’s classic ‘Say It Ain’t So’ and performed tribute sets as The White Stripes. Culture Creature: How did Seasaw’s collaboration begin, and how did you two meet? Eve: Meg and I started to make music together during transitional times in our lives. I had just graduated college but was not employed full-time, and Meg was transferring schools and was home in the interim. Those situations found us in the same job at the same time at an Italian restaurant in Freeport, IL. We struck up a friendship that somehow turned musical and honestly I can’t even remember how we started to physically play music together. Meg had been in a band before, I had never played out and was terrified to do so. I remember Meg’s confidence and boldness; she convinced me that I could do it. Without Meg, I would never have overcome my shyness, there would be no Seasaw, and my life would be completely different. Being so deeply invested and involved in this project for the last few years, It’s impossible for me to even imagine what I would be doing if we hadn’t met. Can you describe your songwriting process and the role of each band member? Meg: We usually write songs separately, and bring them to one another for arrangement and editing. Since we were long distance for the first four years of our partnership, a lot of our process was recording a digital track and emailing for feedback, and then coming together to discuss and arrange. We still use that process sometimes, but it’s nice to be able to play new songs for each other in person, too. We’ve written only a few songs together, as Eve and I have very different writing styles and strengths. For example, Eve’s a much stronger guitar player than I am, so I really love arranging drums, harmonies and keys to the songs she writes. As for our roles, we are 50/50 in this partnership, and nothing I create would be 100% without Eve’s input and creativity behind it. What’s the music scene like in Madison? Eve: One of the many reasons I am so proud to be a part of this community is that Madison has a very inclusive, active and creative music scene. I moved here a year and a half ago and some of my first connections were musicians that had invited us to play with them. Not only are the musicians collaborating with and promoting one another, but the venues and events in town also are championing local music at a high level. There is constant support from our print publications as well, and even our TV news outlets; Meg and I had the opportunity to play on our local ABC affiliate, WKOW 27, in advance of our album release show! The time and energy Madison’s citizens, professionals and musicians put into the arts is evident here in the scale and quality of experiences available. It’s really an amazingly kind and art-positive community to be a part of. What are the biggest challenges involved in performing a White Stripes cover set? Meg: For me, the hardest part was becoming comfortable with a full drum kit. I haven’t played on a full kit really ever, so adding in cymbals and a snare was a new feeling. I also play my kick and tom drum standing up, so sitting down while drumming was different, too. After learning all the songs and getting through the initial nerves, it ended up being extremely fun. I’m glad that Eve was on board to tackle something like this with me – it was a really cool thing to do together. Eve: I am hugely inspired by and in awe of the White Stripes, so I definitely felt a weight on my shoulders to do these brilliant songs justice. Just taking the time to sit with the lyrics and really learn them inside and out was something that I hadn’t done before as a fan, and in doing so, I became even more convinced of just how prodigious the form and wit of this music actually is. Doing any cover is a scary endeavor, especially when you regard the original artist so highly. I had the most fun when I felt a little Seasaw flavor relax me into a tune – like the pairing of “Little Room” which we did in harmony, and then ‘Fell in Love With A Girl’ which is the one White Stripes song we’ve played for years. What are Seasaw’s plans for the rest of 2017? Meg: We’ve got a few shows in the works, but I think we will primarily be focusing on writing some new material. We spent 2016 working on and releasing Too Much of a Good Thing, and most of 2017 touring and promoting it further, so I think we are excited and ready to create new music together. Eve: We are hoping to have a few sneak peeks/listens in the not too distant future!